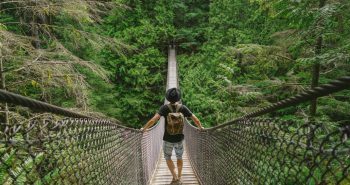 The more I travel the harder it is for me to get excited. The once vibrant picture becomes more mundane and “normal”. 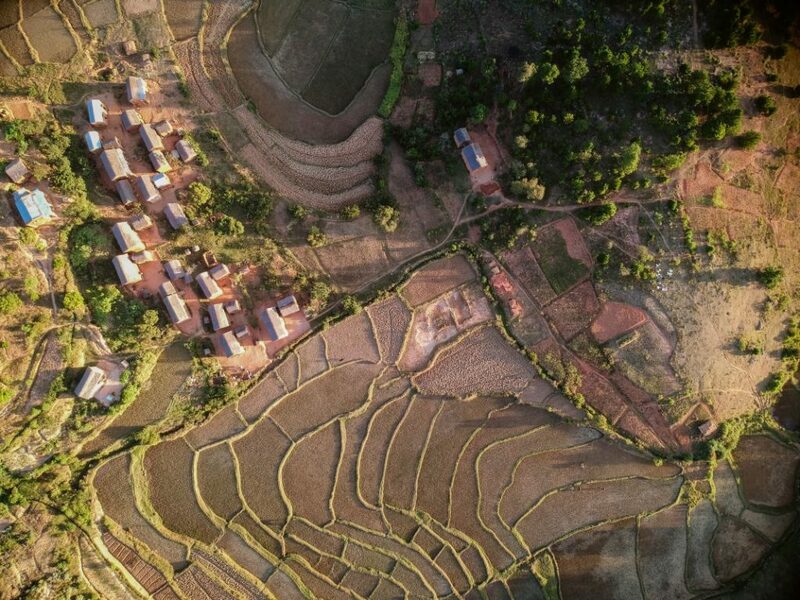 Arriving to Western Madagascar changed this perspective. Having previously believed I may have seen it all has been turned upside down by this stunning region. When the pavement ends so does the modern world. 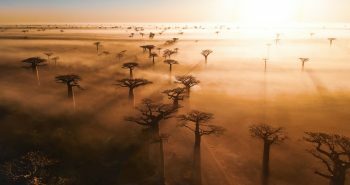 Ancient Baobabs soar above, lemurs leap from tree to tree, eerie jagged rock formations conceal spirits of the dead and wild Zebu stealing tribes rule the areas as they have for centuries. I came looking for adventure and Madagascar gave me exactly this! Why Go to Western Madagascar? 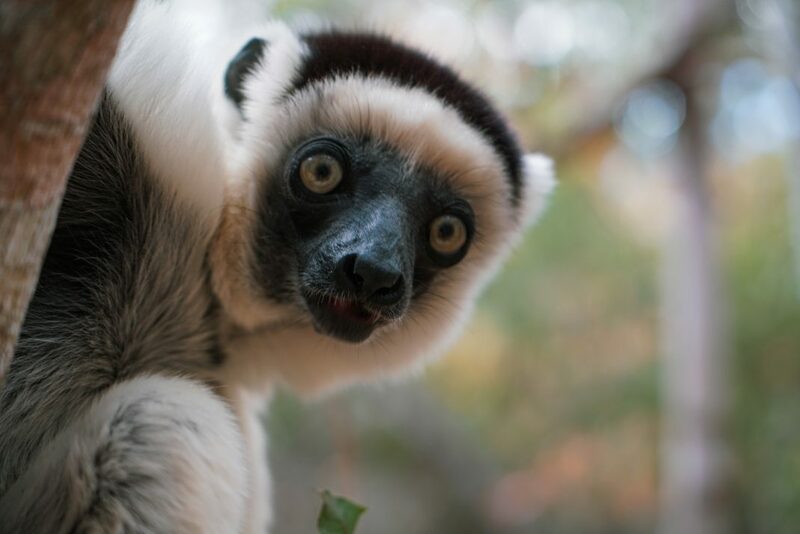 Madagascar is a destination for the adventurous. 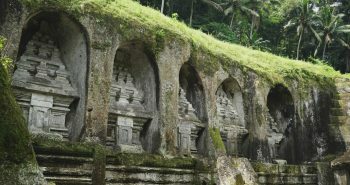 This island nation is teeming with unique wildlife, unusual landscapes and rich culture. 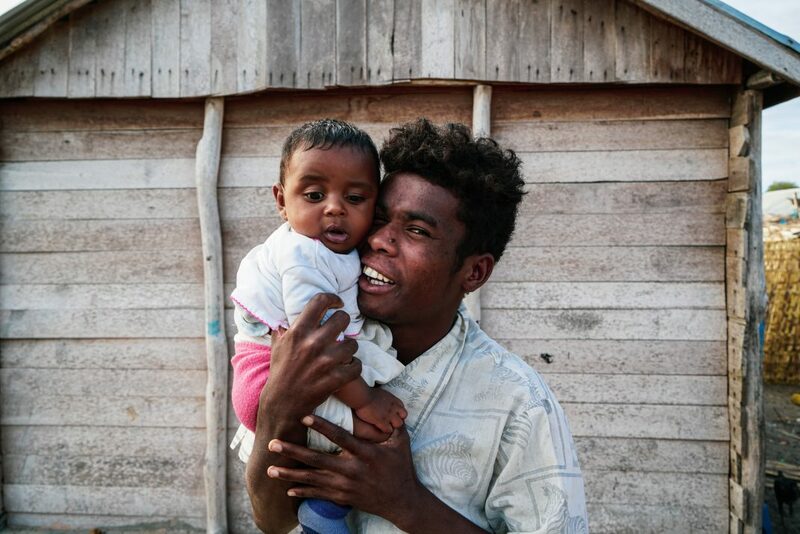 Western Madagascar boasts all of these attributes, but what makes it even more unique is its remoteness. 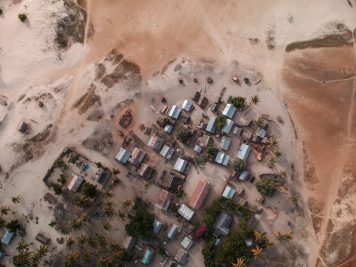 The roads here are terrible, there are wild zebu stealing tribes and there aren’t exactly a lot of options for luxury accommodation, making Madagascar’s west a place not for the faint of heart! Don’t let any of this stop you however! 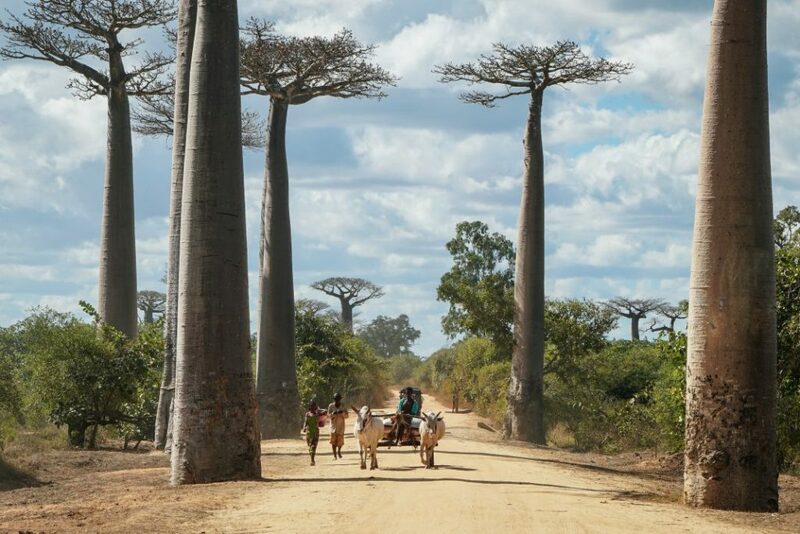 Traveling the Madagascar’s Wild West reveals a true sense of what the majority of the country is like; remote, untamed and full of adventure! 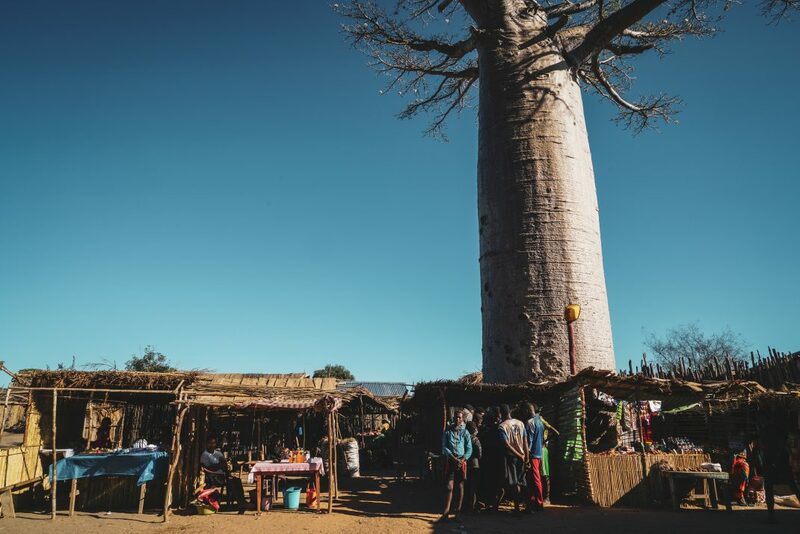 Try hiking in the alien like landscape of Tsingy de Bemaraha, watching the sun set over the giant ancient Baobabs and fishing with Vezo ethnic communities. These are just some of the west’s highlights! 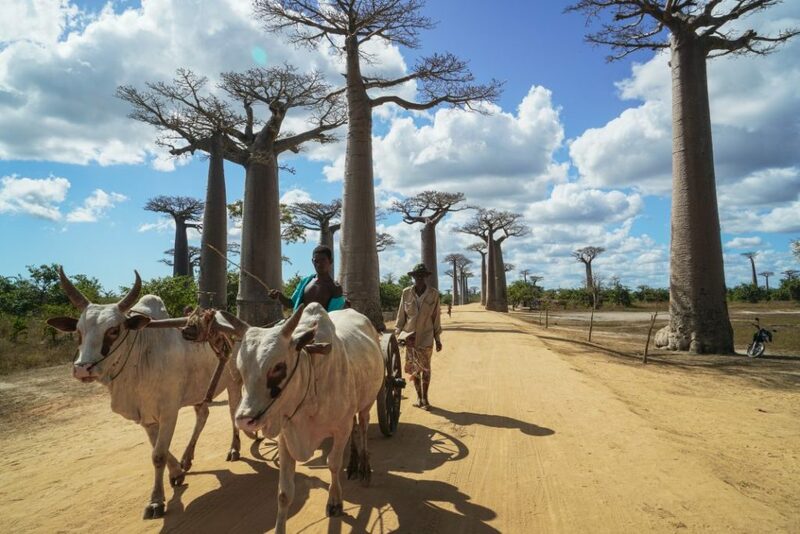 So, lace up your hiking boots and get ready for Madagascar’s Wild West. 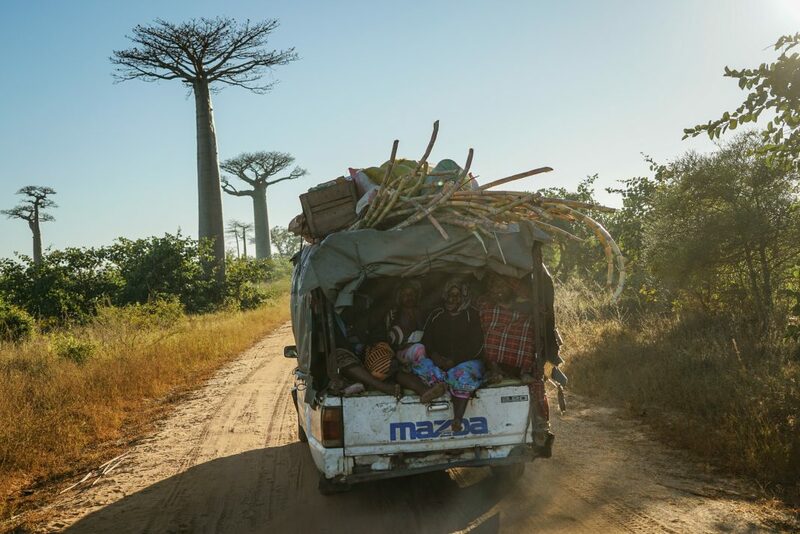 Morondava is the main hub for all adventures into Madagascar’s Western region. 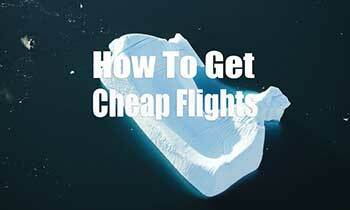 Getting here can be done via simple one-hour (very expensive) flight, or a two-day drive. I opted for the drive as I wanted to experience leaving the highlands and dropping into the western lowlands. 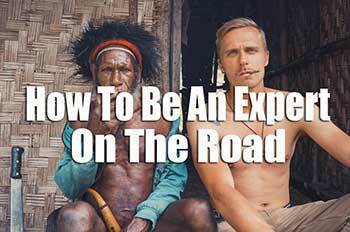 I highly recommend the drive as you pass by several different climate zones, small remote villages and epic scenery. 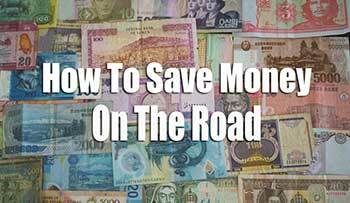 From Antsirabe you can either take a Taxi Brousse which will take around ten hours or hire a car which will take about eight hours with plenty of time for photo stops. It was a long day, but worth it driving to Morondava. Arriving in this dilapidated coastal town after eight hours of twisting roads felt as if we had driven to the end of the earth. Morondava is an interesting place filled with colourful markets and white sand beaches. Although there aren’t any major sights, things like watching the hundreds of fishing sail boats leave the beach in the morning and exploring the nearby Vezo communities are all fascinating things to do. 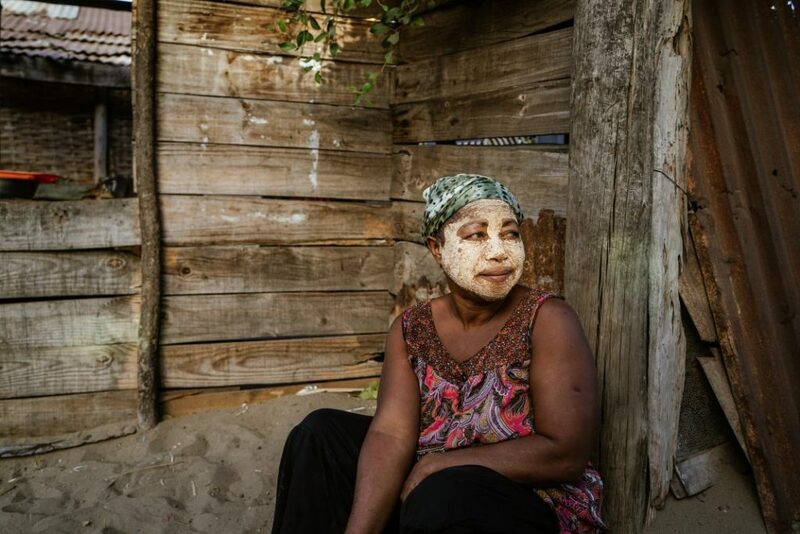 Vezo Tribe – The Vezo can easily be identified by their yellow face paint which is made from a ground up root and used as sunscreen. “Vezo” literally means the people who fish, which makes sense as their lives revolve around the sea. 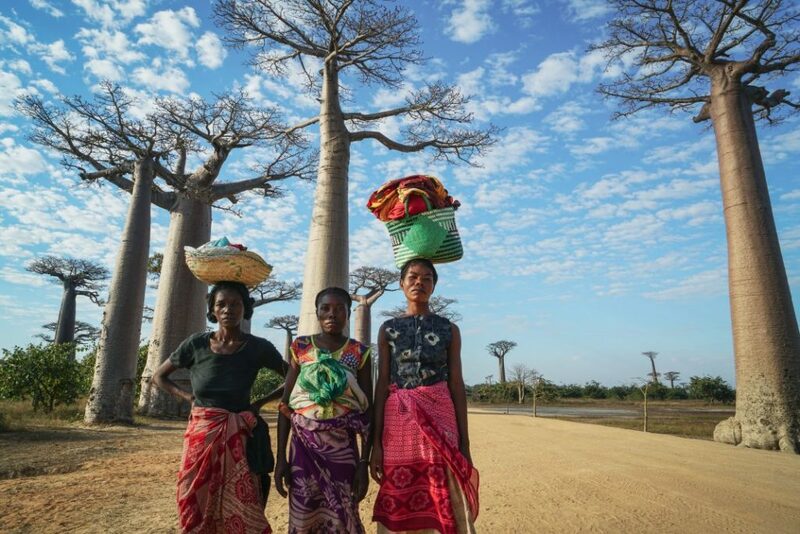 They are semi nomadic, occupying the regions between Monondava and Toliara. 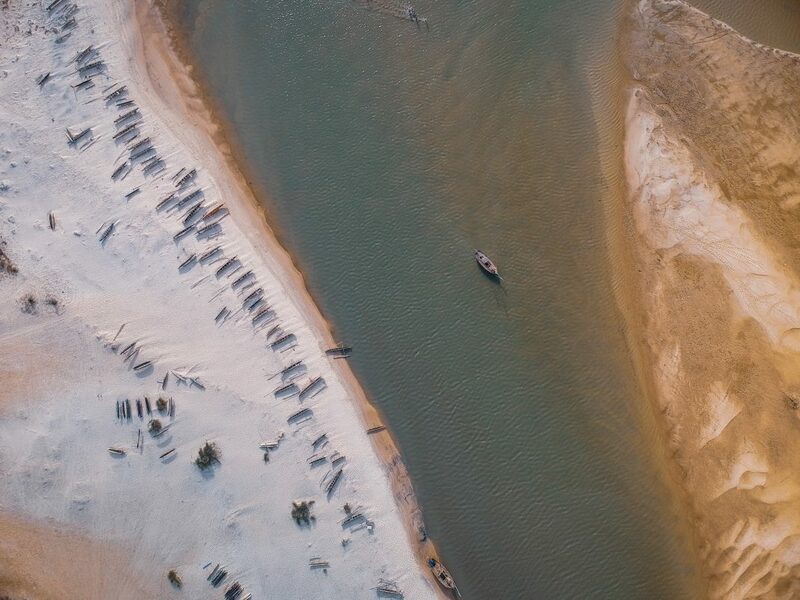 Just south of Morondava are countless Vezo fishing communities. Getting to them is simple. 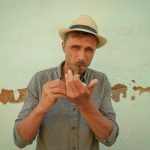 If you follow the Rue de L’independence to its end you will find countless fisherman who will approach you and offer to take you to the villages with their sailboats. The boat driver also doubles as a guide and will show you around the villages. They are also great at explaining things about Vezo culture like fishing, the face paint and the way of life as a semi nomadic fisherman. After a day relaxing on the beaches with the Vezo it was time for the adventure to begin. If you thought the pot holed “paved” roads were bad to Morondava then you are in for a shock! Leaving Morondava and heading north the road turn to sand, mud and sometimes its just non-existent. Having a 4×4 for this part of the journey is essential. 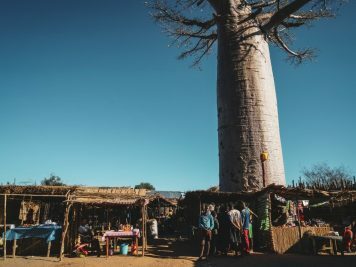 The first stop, which is about thirty minutes from Morondava is Madagascar’s most picturesque stop, the Allee des Baobabs or Avenue of the Baobabs. The sand road leads to a small forest of these behemoths. 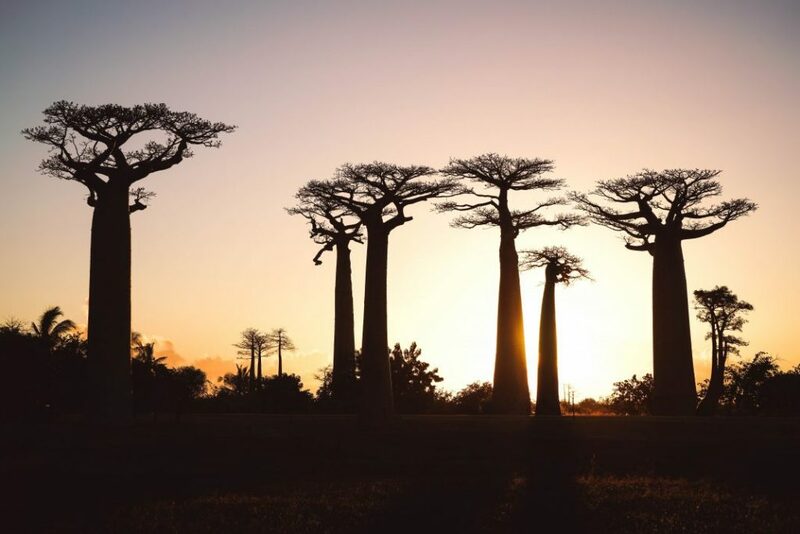 Seeing sunset over the ancient trees is a major highlight for those who make it to western Madagascar. As I saw both sunset and sunrise here my personal opinion: I preferred the sunrise. 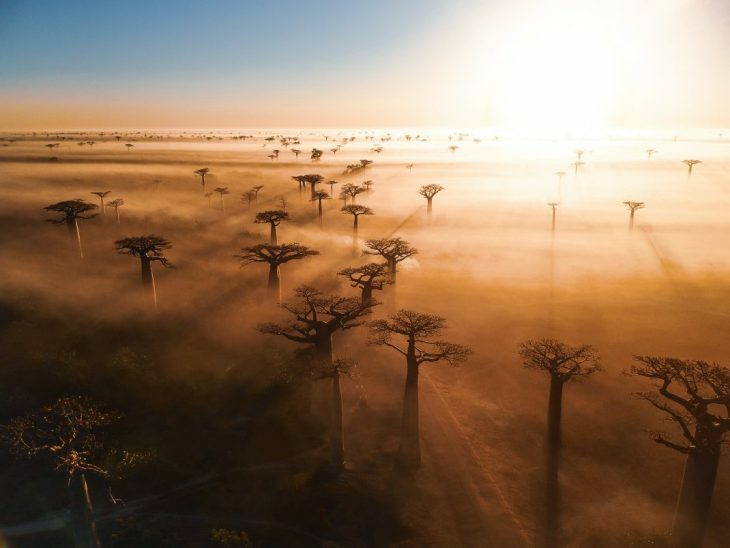 Sunset is beautiful to see the colours of the orange sky contrasted by the giant black Baobab silhouettes, but at sunrise the early morning fog sits low adding to the grandeur of the Baobabs. In the morning I was the only one there as well, I picked a spot and watched life unfold. 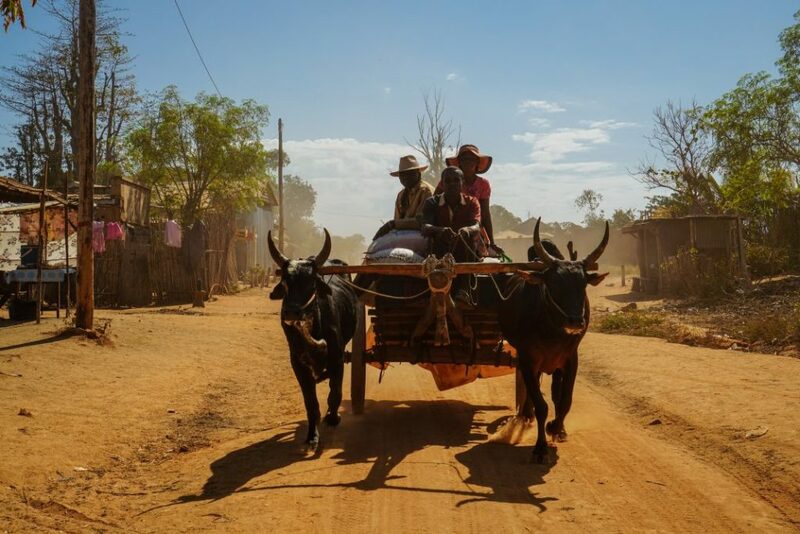 Locals carried stacked baskets on their heads, zebu carts slowly emerged from the fog. I listened to the life all around me waking up. For me this was one of the most amazing experiences I had in all of Madagascar! Wake up early and come for sunrise, I promise you will thank me! 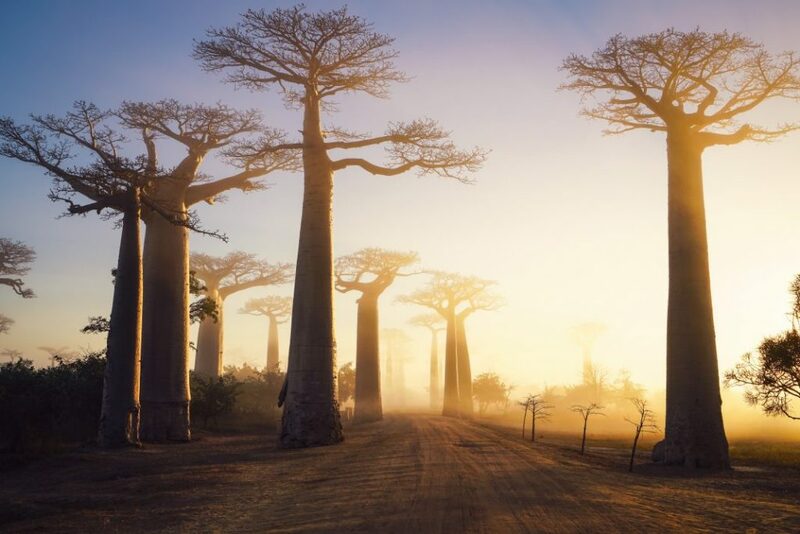 After leaving the Baobab Avenue there is no turning back. The roads get worse, towns are smaller and the forest is much denser. About one and a half hours further up the sandy track is the Reserve Forestiere de Kirindy. This small park can easily be visited in a day trip from Morondava or a pleasant stop on your way to Tsingy. 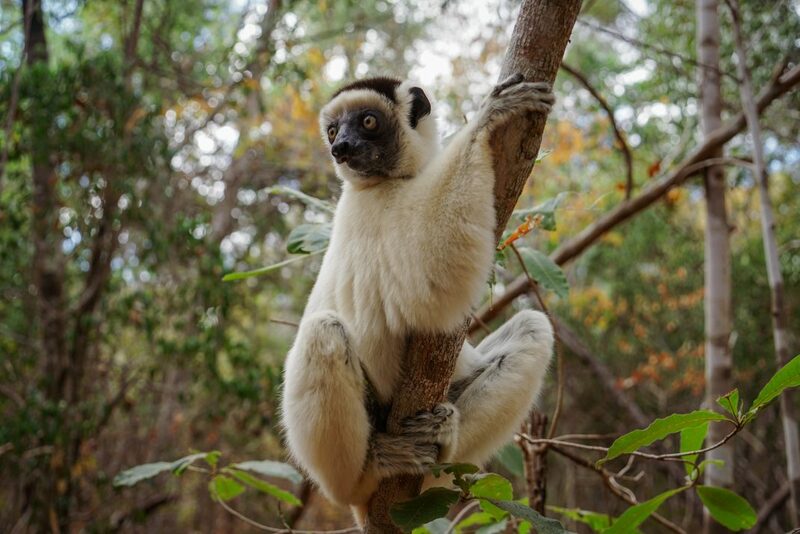 Unlike many other parks in Madagascar, Kirindy is relatively flat, making it easy to hike and spot wildlife. 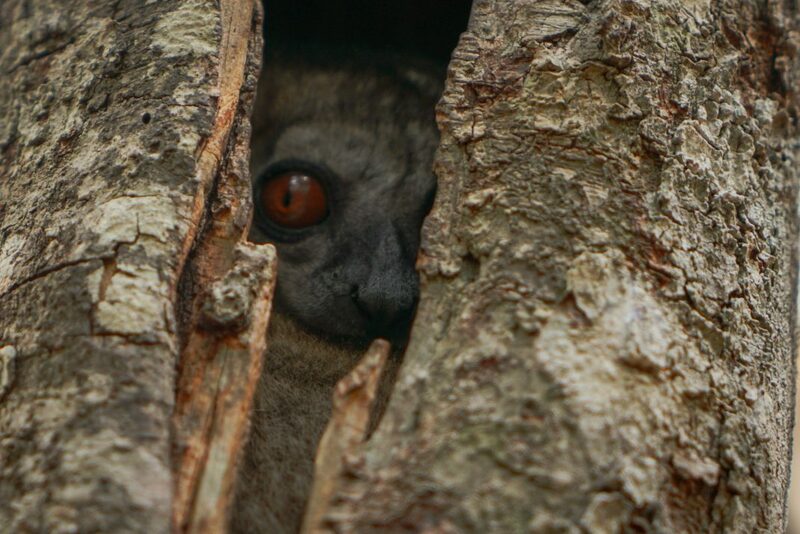 In a two-hour hike I spotted several species of Lemur, many of which came down to within a few feet of me. The major highlight was spotting Madagascar’s elusive Fossa. 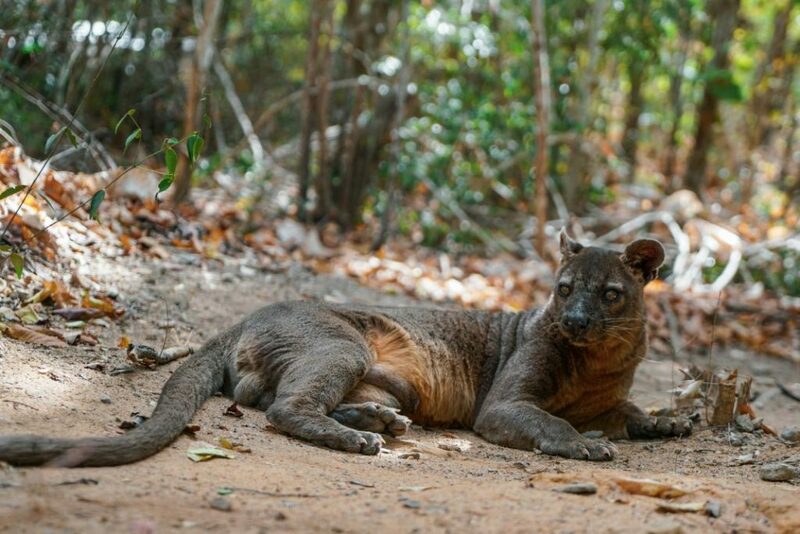 The Fossa is a small wild cat which has become critically endangered in Madagascar due to habitat loss and hunting. In Kirindy the rangers take good care of the Fossa, making chances of spotting them relatively high. From Kirindy it can take up to six more hours more along this dusty bumpy road before you get to the Manambolo River at Bekopaka. 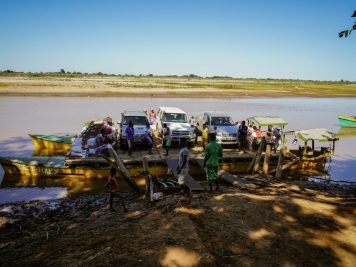 This includes a really crazy one-hour ferry across the Tsiribihina River. 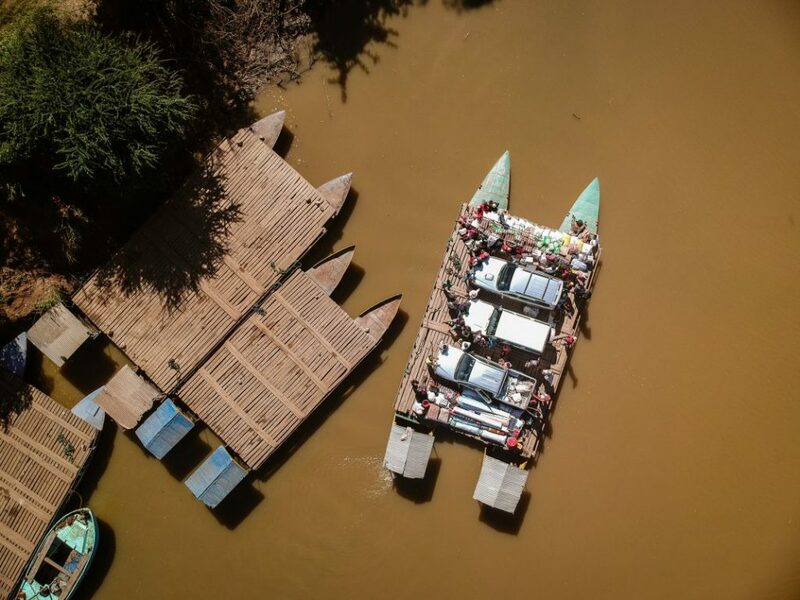 The ferry is two massive canoes strapped together with a sketchy wooden floor which you have to take the 4×4 on from the banks of the river. Lack of safety standards aside, it really is an exciting adventure! 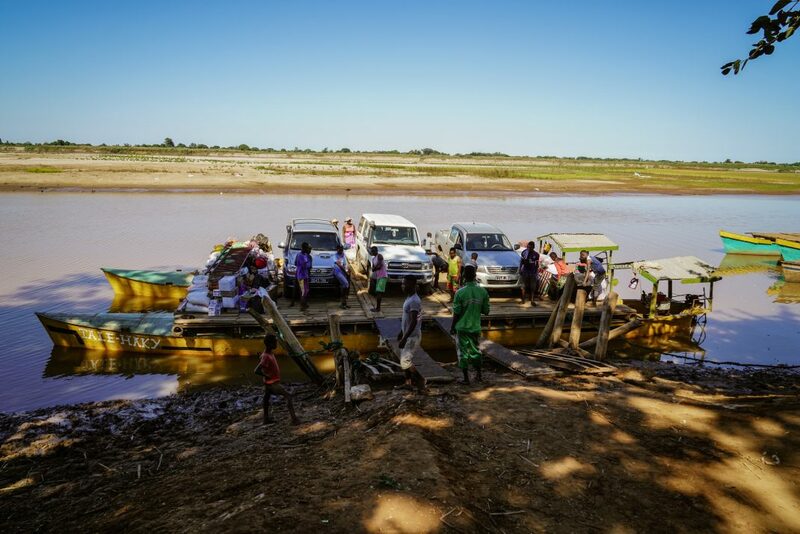 The Manambolo river can be traveled in several ways. Before it was common to take the several days trip to Bekopaka from Tsiroanomandidy by canoe, but because of security reasons this is now reserved for larger groups who can hire out a private motor boat with security. 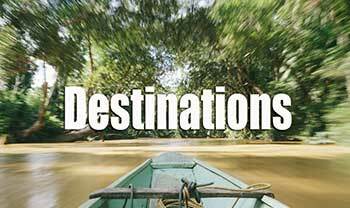 In Bekopaka its easy to hire a canoe to take you up river to see caves full of bats and small villages clinging to the banks of the river. Its worth it to hang out in Bekopaka for an extra afternoon to do this, but I don’t recommend doing anything longer than that as the scenery doesn’t change much and long hours under the sun in a canoe can be quite uncomfortable. Finally! The end of the road. Parc National des Tsingy de Bemaraha is what makes suffering through the bone rattling, dusty roads all worth it. From Bekopaka, it’s just a short 45-minute drive to the entrance of the park. 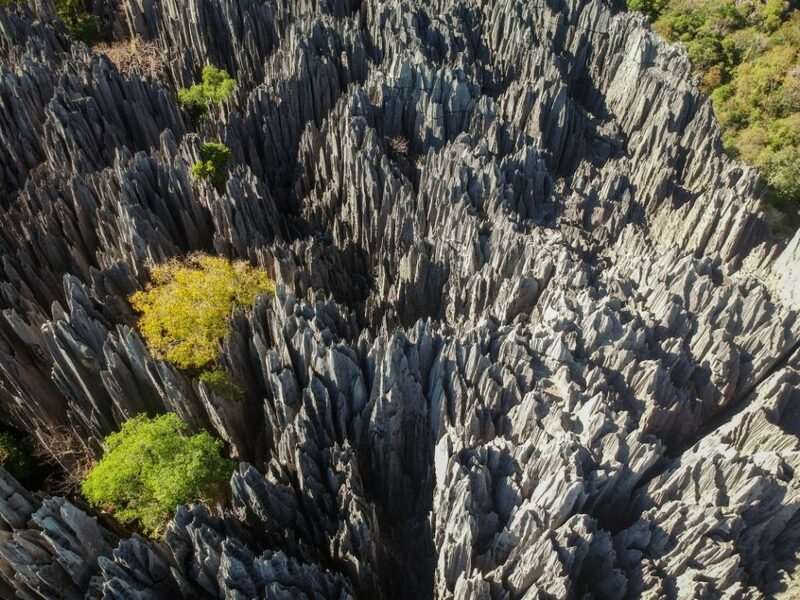 Tsingy de Bemaraha is a UNESCO World Heritage listed sight for good reason. The other worldly, jagged spires of rocks make for amazing hiking opportunities. 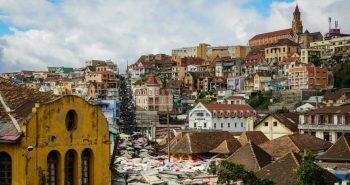 The area is considered sacred to the people of Madagascar so you must not venture off the paths and do learn what is taboo before entering here. From the park entrance the trail leads to some grassy hills before you begin the ascent up into the jagged peaks. 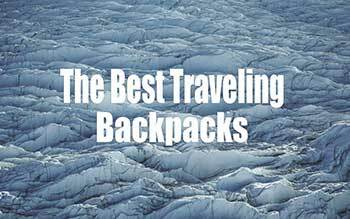 Your compulsory guide will provide rock climbing harnesses and carabiners to clip into mounted wires on the more dangerous parts of the climbs. 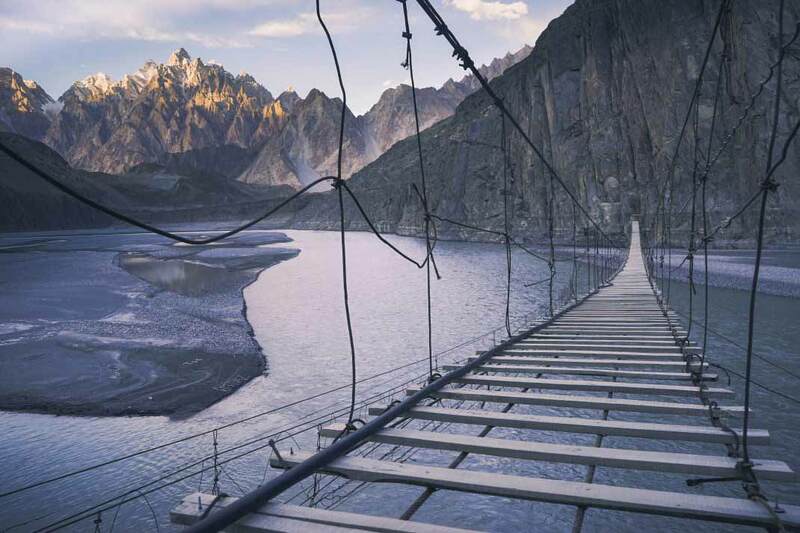 Once you summit the first peak you will clamber along the rock formations and cross several wire suspension bridges, crawl through narrow pitch-black caves and witness some of the most unusual scenery on the planet. If you are lucky you may spot some wildlife as well. 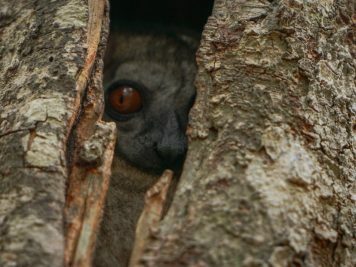 On my hike I saw several lemurs, Ring Tailed Mongoose and many bird species. 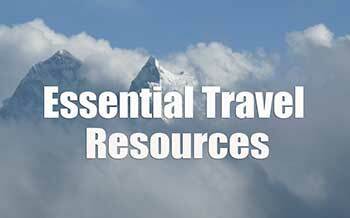 Do opt for the longer 4-hour trek as it takes you to much more remote parts of the park. 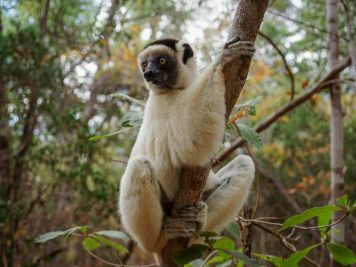 Here you most likely won’t see many other travellers and you can really immerse yourself into Madagascar’s remote west! 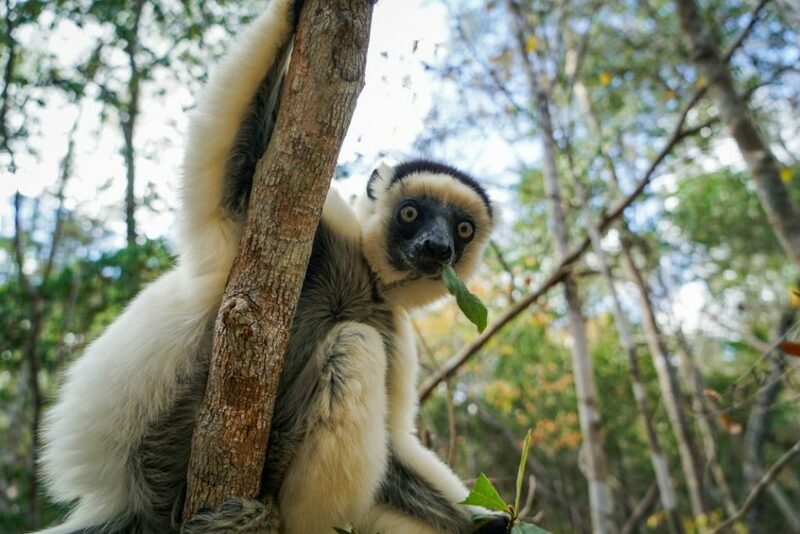 Madagascar is a very remote destination which requires special planning ahead of time. Many locations including Tsingy de Bemaraha can not be reached by public transport so finding a tour company you can trust is essential. 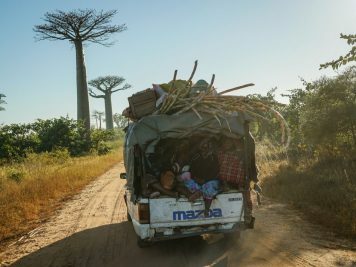 Madagascar Natural Tours didn’t just make my adventure possible but made it unique and catered to my extreme needs to get off the beaten track. 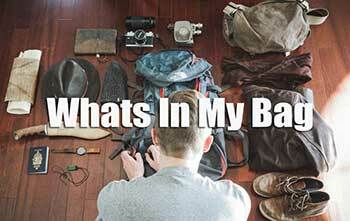 I like pushing myself when I travel and finding undiscovered places and so did my this organisation! 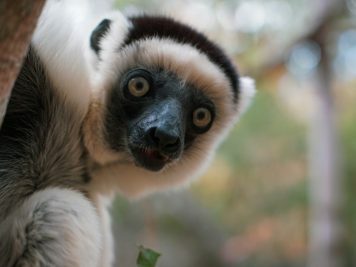 Madagascar Natural Tours is also an eco friendly company that is very conscious about conserving Madagascar’s unique ecosystem. 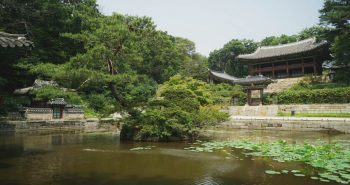 The place is really wonderful and the richness of nature delighted me. The way you portrayed the whole Madagascar with eye catchy places is marvellous. 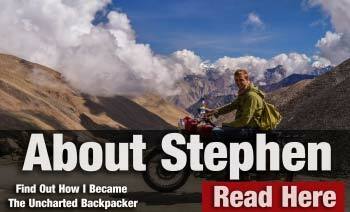 Thanks for sharing this awesome story with us. 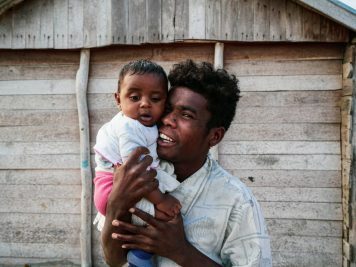 I started getting interested in Madagascar since I learned about how among the island’s early inhabitants were sailors from across the Indian ocean in an archipelago that is now known as Indonesia. The country’s president and politicians, as well as most of its people look just like Indonesians even today. Glad you reminded me why I should never give up my dream to visit this country. 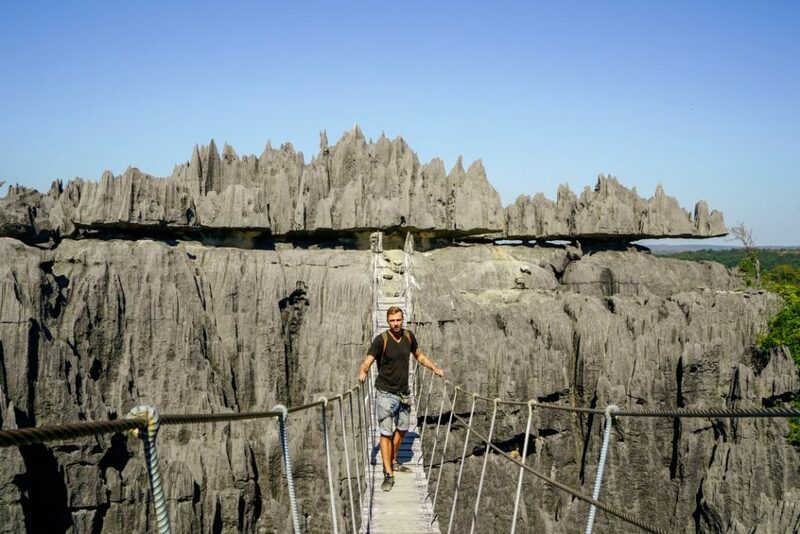 How hard is the tsingy walk…really? I have a knee problem! Is it safe to bring good camera?